As most of you know, I am not the guy I was a decade or so ago. After I quit the bottle, I gave all my Solsun and Sierra Nevada Pale Ale T-shirts to the Salvation Army. I had a small collection that would adorn any Gap kiosk sufficiently. I have been saving a couple of Bell’s Beer bumper stickers for the fishcar and drift boat; however, I’ve made the executive decision to pass on these decals for a few(4) fortunate individuals to represent the now famous Kalamazoo Brewery along with the new PETOSKEY Brewing Company as well. Hey, did I forget to mention a new and improved TNT decal for the lucky four peeps who LIKE and SHARE this post on Facebook. Get on it, like white on rice and spread it like Nutella. 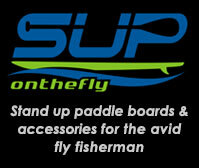 Winners will be chosen by random number generator on Sunday Night and announced Monday morning. 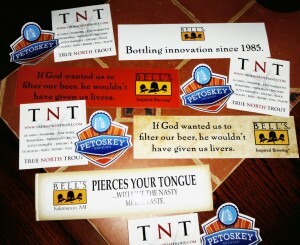 Let’s see if we can generate some beer aficionados in the fly world for TNT.